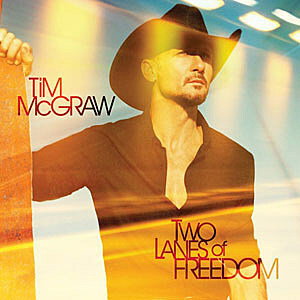 Tim McGraw is an American country singer and actor. Throughout his career he has released thirteen albums, eleven of which have consecutively debuted at number one on the Billboard album chart. He has also won 3 Grammys, 14 Academy Of Country Music Awards, 11 Country Music Association Awards, 10 American Music Awards and 3 People's Choice Awards. My favourite track from the album has to be the second single One Of Those Nights. The track as a whole has a relaxed yet rocky feel and really suits Tim's voice. I have been playing it on repeat for a while and haven't grown tired of it, something that in my opinion shows a great song. In contrast to the rocky feel of One Of Those Nights, I also really like Book Of John. The song as a whole is very lyric based and the stripped back instrumentalisation really works well with the track and adds another dimension to an album that includes songs such as Truck Yeah. "When I heard the song, I knew I wanted Taylor to sing on it, and I've been looking for years for something to have Keith play on, because I think he's one of the best artists we have out there. He's a fantastic guitar player and he went to town on this thing—I would do this for a hundred bucks a night and never sing another lick if I could play guitar like that." Whilst it is very hard to decide, I think my least favourite song is probably Truck Yeah. Whilst having a rocky song like this adds to the versatility of the album, I don't think it really needs it when some of the other songs such as Tainted Windows and Nashville Without You are so strong and then there are One Of Those Nights and Two Lanes Of Freedom that still have a rocky feel without going overboard. It was announced a few months ago that Tim will headline the first night of C2C : Country To Country Festival over here in the UK. I am really excited about this, especially as Vince Gill, Little Big Town and Kristian Bush will also be joining him. All in all I'd definitely recommend buying this album. Tim McGraw has a different voice to many of the male country artists out there at the moment such as Eric Church and Kip Moore but he definitely knows what suits him and has created a very strong album.